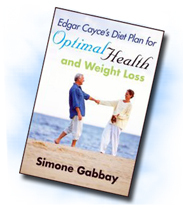 Simone Gabbay, RNCP, is a holistic nutritionist in Toronto, Canada, who has studied and worked with the Cayce material for more than 30 years. She is the author of two previous books on diet and health, both published by A.R.E. Press. She writes two regular magazine columns and is a frequent contributor to major Canadian health publications. Visit her website at http://www.simonegabbay.com .